3 players across the top. 0 players behind the goal. - A traditional set for Man-Up Offense. 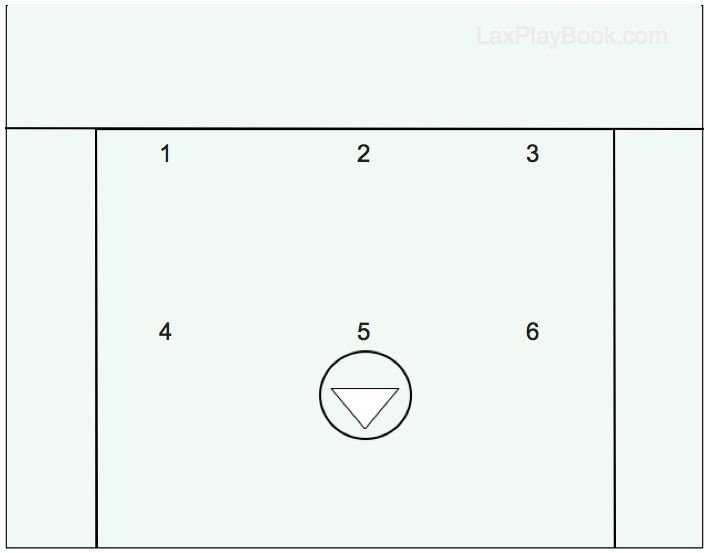 The 3-3 is great for Man-Up EMO because every offensive player is in a position to be a threat to shoot and score. Alongside this, all six offensive players are also in position to use passing lanes left open by defensive missteps and get the ball to a teammate in position to score. Teams will often start Man-Up Offense in a 3-3 even if they intend to run another set because this will trigger the defense to react and call a defensive set that might not be as effective against a different look later in the series. The downside of the 3-3 set is that offense players are not automatically in position to back up shots. The offense must be lively and anticipate the sprint to chase the ball. Most coaches feel that the advantage of forcing the Man-Down Defense to guard all six offense players outweighs the risk of losing a possession shot on the chase, and coaching the players to use set plays and recognize looks for when to expect shots helps the team maintain possession of the ball on Man-Up. The even balance and spacing of a 3-3 Set also makes it more difficult for a true quarterback-type offensive player to operate.